Adopted on April 30, 1902. 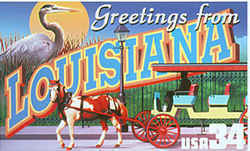 The Great Seal of the State of Louisiana was adopted as the official state seal of Louisiana on April 30, 1902. The seal consists of a heraldic charge called a "pelican in her piety," representing a Brown Pelican (the Official State Bird) representing a mother pelican wounding her breast to feed her young from her own blood. This symbol, emblematic of Christian charity, is also found on the Louisiana state flag. 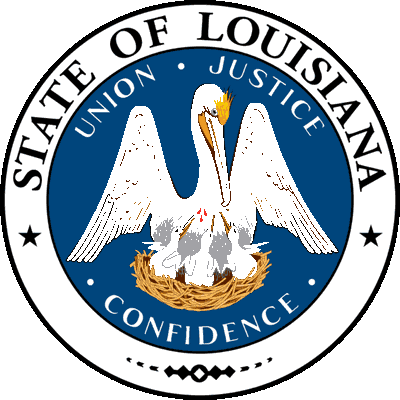 The Louisiana state motto of "Union, justice, confidence" surrounds the birds on the state seal. An outer ring further identifies it with the words "State of Louisiana". Louisiana's first territorial governor, William C.C. Claiborne had great admiration for the awkward bird that inhabited the Gulf Coast region. The pelican, rather than let its young starve, would tear at its own flesh to feed them. The Governor's great respect for the Pelican led him to first use the bird on official documents. Many different versions of the present seal, including one with as many as twelve chicks in the nest, were utilized. Pelicans rarely have more than three chicks in the nest at any time, and it was a version with three chicks that was officially designed on April 30, 1902 as the official state seal. In 1902, Governor William Henry Wright Heard directed the Secretary of State to use a state seal of this description: "A Pelican, with its head turned to the left, in nest with three young; the Pelican, following the tradition in act of tearing its breast to feed its young; around the edge of the seal to be inscribed 'State of Louisiana'. Over head of the Pelican to be inscribed 'Union, Justice', and under the Pelican to be inscribed 'Confidence'." That is the seal that represents the State of Louisiana today. During the 19th century it was traditional in Louisiana flags and the state seal for the "pelican in her piety" to have three drops of blood on her chest. However, in later years the tradition (on both the state flag and seal) had been haphazardly followed, which was noticed by an eighth-grader at Vandebilt Catholic High School in Houma who brought this to the attention of his state legislator. The issue was resolved in April 2006, when the Louisiana State Legislature passed a bill (House Bill 833/Act 92) which requires three drops of blood to be depicted on the pelican used in both the state's flag and seal. In November 2010, a new version of the flag bearing an updated version of "A Pelican In Her Piety" was unveiled. The secretary of state is the custodian of the official artwork for the state flag and seal. 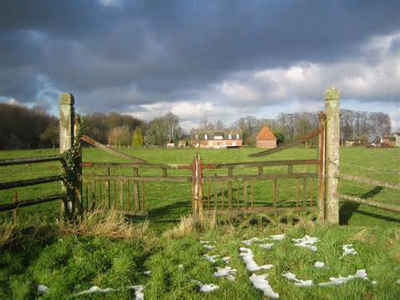 This artwork, in the form of digital files, is to be used as is, reproduced in the manner specified below. No alteration of the artwork provided by the secretary of state is allowed except as provided below. The secretary of state shall supply line art for the seal for metal casting embossed seals and seal devices. The seal consists of a central crest within a circle and an outer circle bearing the state name and ornamentation. Artwork is identical to the flag's crest but displayed without the banner. The motto is circumscribed around the crest with: "Union Justice" above the Pelican, the words separated by a single bullet, and "Confidence"below the crest, bracketed by bullets. The font is the same hand-rendered font as on the state flag. "State of Louisiana"shall appear in the outer circle and uppermost on the seal, circumscribed along the uppermost portion of the outer circle. The font for this shall be AgaramondPro-Bold (OpenType). The state seal shall be reproduced in full, four-color process printing using files provided by the Louisiana Secretary of State's Office, or in black and white using only line art supplied by the Louisiana Secretary of State's Office. The artwork supplied by the secretary of state is to be used as-is with no alterations except sizing as needed. 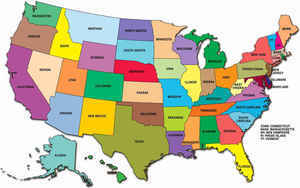 Louisiana state agencies and departments may, however, adopt the seal as their own by adding the agency or departmental name, using the designated font, circumscribed along the bottom portion of the outer circle; the same circle in which "State of Louisiana"is placed. A. There shall be a public seal, which shall include the pelican tearing its breast to feed its young, for the purpose of authenticating the acts of the government of the state of Louisiana. B. 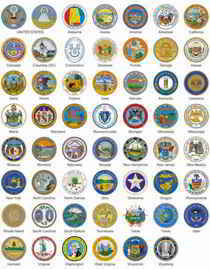 The Secretary of State shall be keeper, and shall affix the public seal to all official acts, the laws alone excepted. C. The design of the seal depicting the pelican tearing at its breast to feed its young shall include an appropriate display of three drops of blood. No state agency shall discard or otherwise dispose of flags, stationery, or any other device that depicts the state seal to accomplish the purposes of this Section, but shall take the appropriate actions to implement the new depiction of the state seal. Nothing in this Section shall preclude the secretary of state from utilizing the new design of the seal in conducting the ordinary business of the state. Acts 2006, No. 92, §1.